Judging by the progress of the photos over the last few days, I had either just got back from the supermarket and was walking home from the bus-stop, or had just been to see one of the groups I was working with – either way this group of pictures says “heading home” to me, as I lived just off Str. Balcescu. 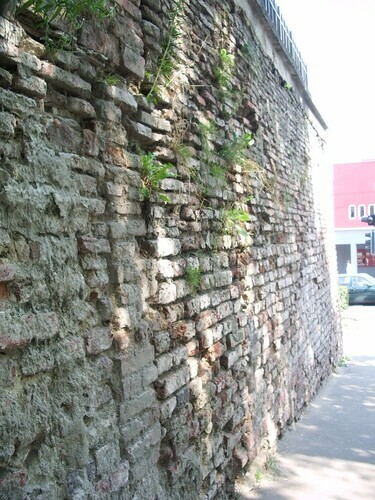 A bit over-exposed as it was so sunny, this is a very close-up view of the city walls, just over the road from the theatre, and underneath the Pavilion venue. 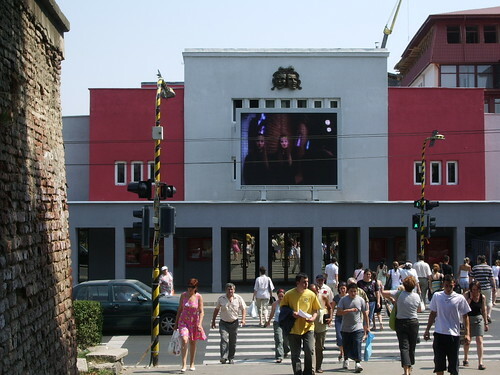 The Radu Stanca theatre (just next to the Dumbrava which you can see in the background on the right) is one of the most prestigious theatres in Romania (in fact right now they are performing at the Edinburgh Festival, in a production of “Faust”). As the canicula (heatwave) was so relentless, in every town with a local branch of the Crucea Rosie (Red Cross) you’d see their volunteers trying to help people who were suffering in the extreme heat. As well as giving out water, they also had doctors on hand to check blood pressure etc. It’s not to be sniffed at – while I was there a number of people died from heat-related problems (although not in Sibiu I don’t think, just elsewhere in the country). 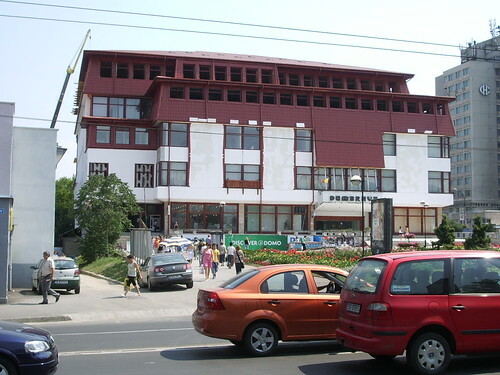 Here’s another view of the front of the Dumbrava department store. 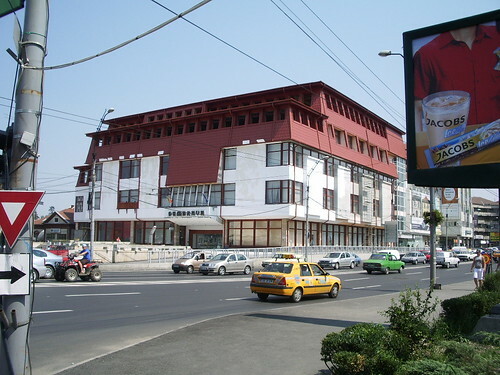 This building is the Dumbrava department store. As well as the several storeys in the store, just in front of it is a subway which included some private (and I thought rather expensive) stores. Rather bizarrely, this statue stood in the driveway of a private residence. 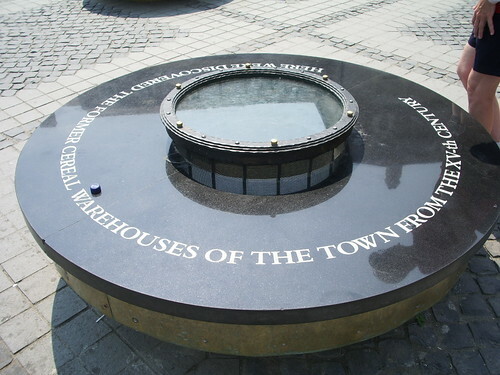 The building next to it (from where I took the picture) was the place you have to go to pay your gas bill. It just seemed totally out of context with the rest of the city! 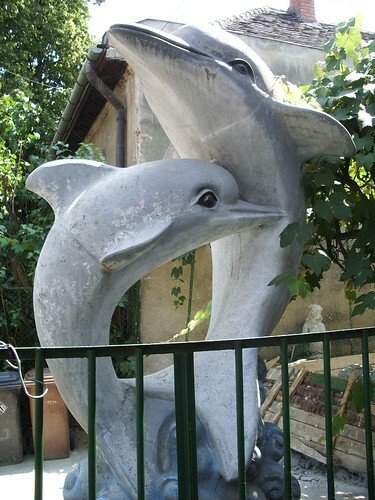 Posted in Uncategorized | Tagged: dolphins, Sibiu, statue | Comments Off on And now for something completely different! 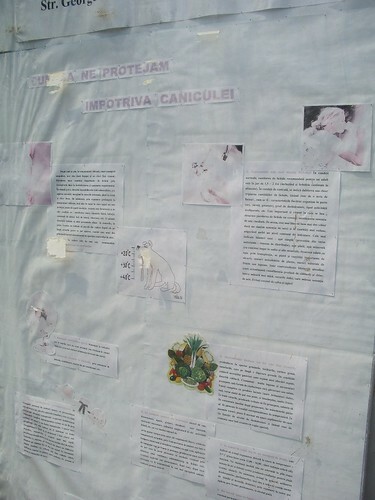 This rather tatty and faded poster on a noticeboard of the Public Health Department is giving advice on how to survive the canicula – Romanian for “heatwave” (I think the French word is similar, “canicule” or something like that). 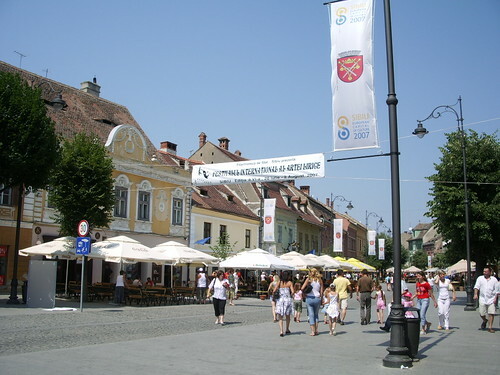 Even now, having been away from Romania for a couple of years, having experienced the heat in the summers of 2006 and 2007 I still call hot weather “canicula” in my head (although, to be honest here in Scotland I don’t get that many opportunities to experience it!). I really can’t explain just how hot it was – I felt permanently exhausted, and was showering at least twice a day, the heat was pretty relentless and only punctuated by occasional thunderstorms which only cleared the air for an hour or two before the heat came back! Anywhere that had air conditioning was highly sought after (by me anyway!). What always used to amaze me was that I would see lots of people wandering around eating hot sweetcorn (porumb fiert) having bought a corn cob from one of these street vendors. It’s not such an amazing thing in and of itself, but by this point the temperatures were around 40°C every day! It was all I could do to summon the energy to buy ice cream, never mind something this hot! This vendor is just outside the Dumbrava department store.